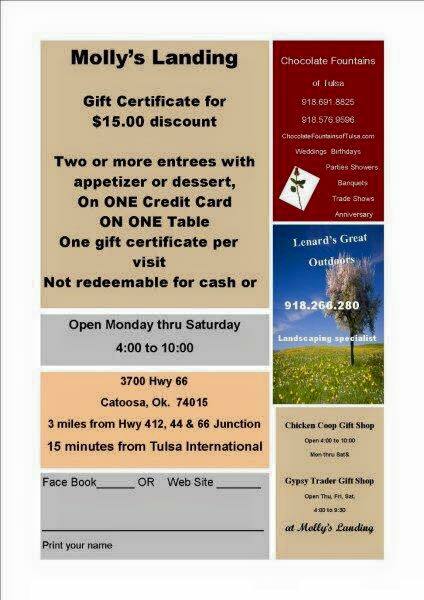 Located just outside Tulsa in Catoosa, Oklahoma. The log cabin that is now Molly's Landing, was opened in 1984. The original log home kit was designed for 3 bedrooms with a garage. Now Molly's is known by many to be the Best Steakhouse in the Tulsa Area offering private dining rooms for groups up to 45, a unique gift shop, and designated landing area for those arriving by helicopter (check out tulsa county helicopters for this travel option)! Molly's Landing has established a reputation in the tulsa community over the last 30 years not only as the best place to enjoy a perfectly cooked, wet aged steak but also as a dining destination for premium lobster, shrimp, and seafood. locals come in every night for the best quality seafood deal in town - our famous lobster tail dinner for only $24! Private Rooms, Gift Shop, Outdoor Chess Game, Helicopter Access, Home Grown Spices. Click here for a free Coupon! Find out about Molly's Taqueria & Tamale Wagon here! See how Molly’s Landing was voted one of the Best Steakhouses in Tulsa (Area) for 2016! Served with cheese cubes and peppers with Ranch Dressing. Sautéed with onion, bell peppers, mushrooms and our famous fish seasoning. This recipe has made it around the world in the Hwy 66 Cookbook. Using fresh Atlantic salmon & handmade daily. Served with golden brown toast or GF crackers. This could be seasoned with our Jalapeno seasoning for extra zest. Dark Chocolate and summer blackberry, opulent fruit and full bodied tannins. Intense spicy fruit with a rich textured finished in Oak. Old vine red explodes with raspberry, hints of orange rind, clove and rich caramel. Rice and ripe, focused with juicy blackberry and cherry fruit, milk chocolate, with a creamy French vanilla middle and a lingering finish. Rich aromas of dark cherry, caramel, toasted marshmallow's and white pepper. Rich and round with wild blackberries & mocha flavors. Strawberries with floral notes and a bright crispness. Delicate floral & white fruit aromas and flavors. Peaches, figs and melon with a dash of grapefruit & squeeze of lime. This wine overflow's with aromas of mandarin orange, honeysuckle, lemon zest, and melon. Clean and crisp. Medium bodied with peach & green apple flavors. Aromas of Cherries, Strawberries, and Plums with white peppercorns. Bursting tropical flavor of pineapple, mango, papaya & apples. creamy texture, with scents of hazelnut, caramel and spiced apple. Crisp & lean with good weight in the mid-palate. Crisp Flavors of pears & apples with oak overtones. Fresh peaches & apricots, full sweet fruit flavors. Decliate & fruity with a hint of honey. Molly's Landing offers two separate amazing private dining spaces for groups of 25-45 people. Choose Molly's for your next special event or business dinner! Although Molly's is a first come, first serve restaurant we do reserve our private dining rooms for parties of 20 or more. Simply call 918.266.7853.